It may come as no surprise that the world’s most populous nation is also home to the largest platinum jewellery market. Unlike Europe or Japan, where the automotive industry consumes the largest share of platinum, jewellery accounts for approximately 70% of China’s demand, with around 12 million pieces sold each year. In 2017, two decades after the introduction of platinum to Chinese consumers, the platinum jewellery industry has found itself in a four-year demand decline. Many have asked: why is this happening, and how can platinum jewellery demand return to the growth of the past? Selling jewellery is an old business in China rooted in long-lasting gold jewellery retail, which is over ten times that of platinum jewellery. In the late 1990s and mid-2000s, platinum jewellery attracted young consumers as an alternative metal to gold with a much higher value than silver. A nation-wide consumer campaign by Platinum Guild International brought in shoppers who were looking for something fashionable that 24k gold jewellery could not offer. 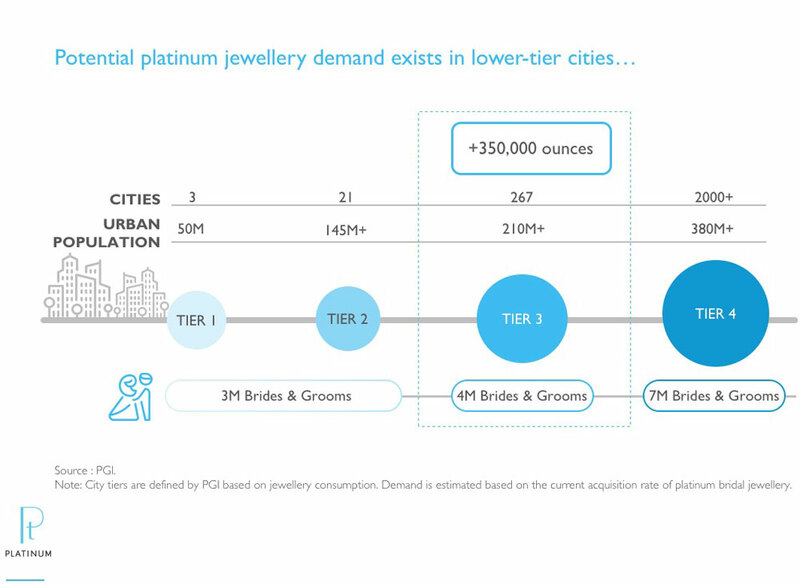 Local jewellers in Mainland China began selling platinum based on weight, just as they did for 24k gold; while some Hong Kong-based retailers applied piece-based pricing. These two methods reflect a very different product offering and margin structure. 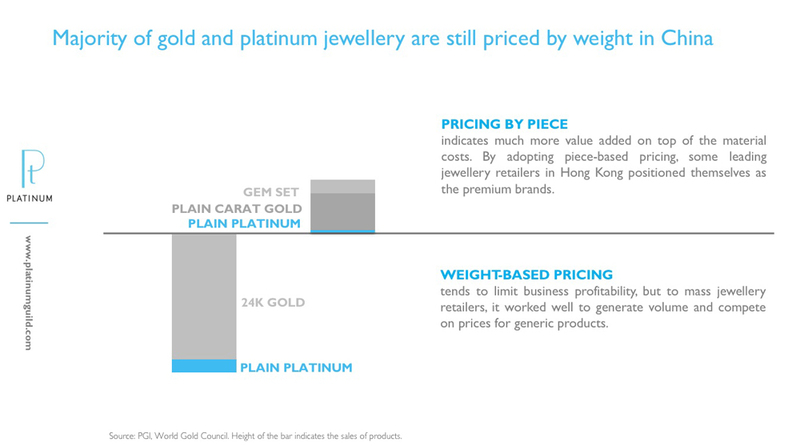 Weight-based pricing usually applies to generic 24k gold products with a higher revenue share and stock turnover. It also accounts for the majority of platinum jewellery sold. Before 2013, fabricators were happy to see growth as they quickly ramped up their output to reduce unit costs. Unlike Japan, the US, and Europe, over 80% of platinum jewellery in China is still in metal-only form, such as plain rings and chain products, and is primarily produced by plain jewellery manufacturers. Differentiation of those products is limited, which enables large-scale production. Some plain platinum jewellery plants in China used to produce around 300,000 ounces of platinum jewellery per annum at their peak. 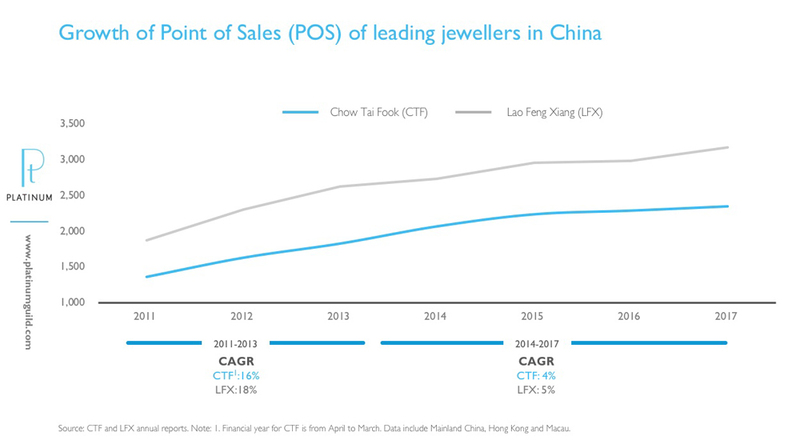 From 2001 to 2013, Chinese retail consumption of precious metals jewellery expanded, with retailers focusing on increasing their revenue and market share of the jewellery industry. The steady rise of metal prices and inventory appreciation also allowed sales channels to increase distribution which enabled better market penetration and in-store visibility. Up to the Global Financial Crisis, the platinum price rose in early 2008 to over 2,000 USD per ounce before it collapsed to below 900 USD per ounce in October of the same year. Fortunately, the risk caused by price volatility was quickly offset by aggressive network expansion of some leading jewellers, which led to a strong recovery in factory orders and stock building. In 2014, a number of leading retailers had already established their presence in Tier 1 and 2 cities, as well as some Tier 3 cities across China. The aftermath of the slowing economy and anticorruption campaign from late 2012 began to take its toll. Between 2014 and 2016, Tier 1 and 2 cities experienced falling store traffic, and many jewellers reported a decline in sales. Finished stock built at higher platinum prices before 2014 also placed pressure on new orders. 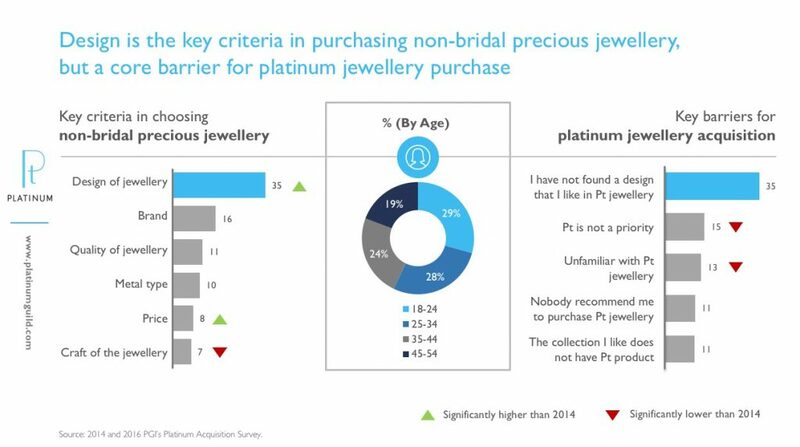 However, consumer demand for platinum jewellery has not declined in all categories. 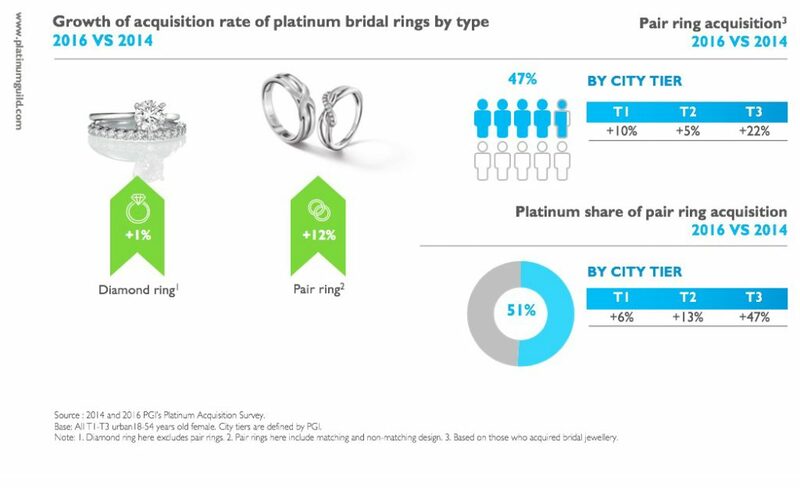 Thanks to the marketing of platinum bridal jewellery, and its association with eternal love, platinum enhanced its position in the bridal category and its size grew 22% between 2014 and 2016. 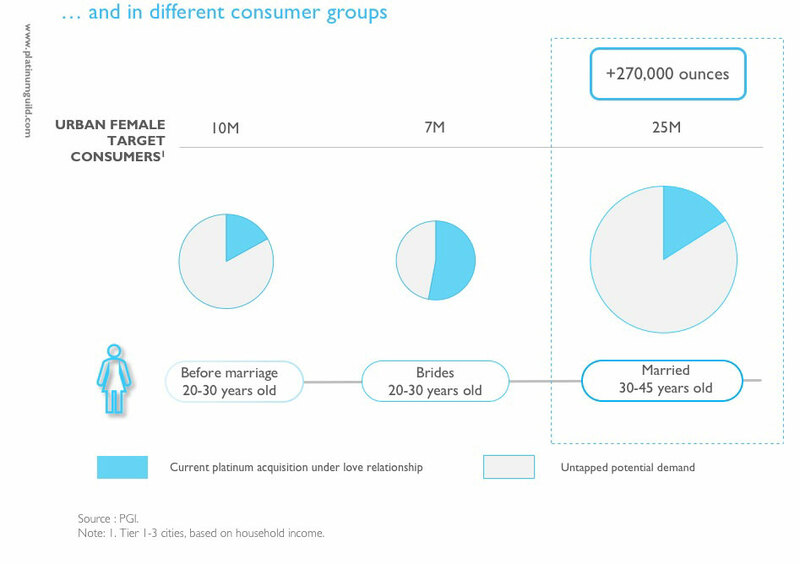 The introduction of exchanging wedding bands between brides and grooms by PGI resulted in substantial growth in platinum pair rings, especially in lower tier cities. years, especially among younger groups. 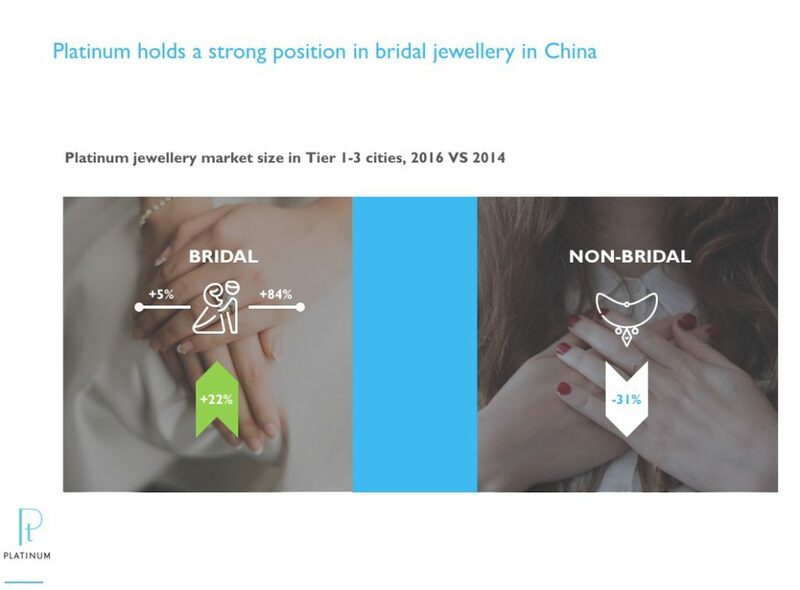 Consequently, the non-bridal category, which accounts for 70% of China’s platinum jewellery market, lost over 30% ounce volume in Tier 1-3 cities during the same period. In terms of retail, pressure on driving sales has led to a shift in focus on conversion rates and product margins. Similar to 24k gold, when prices began to experience a downward trend, weightbased pricing eroded platinum jewellery margins and damaged the confidence of retail stock building. This impacted in-store availability and product offering. For instance, more retailers chose to prioritise high-profit products such as 18k gold and gem-set jewellery, which are both priced on a per piece basis. Increasing operation costs and softening sales have forced plain jewellery manufacturers to compete on fabrication charges to maintain their economies of scale, rather than investing in technical R&D for product innovation. For gem-set manufacturers, the decreasing orders of platinum jewellery and longer production times (compared to 18k gold jewellery) has encouraged them to replace platinum with 18k gold gem-set products. To achieve a high margin for platinum jewellery, one approach is to change the pricing to piecebased. 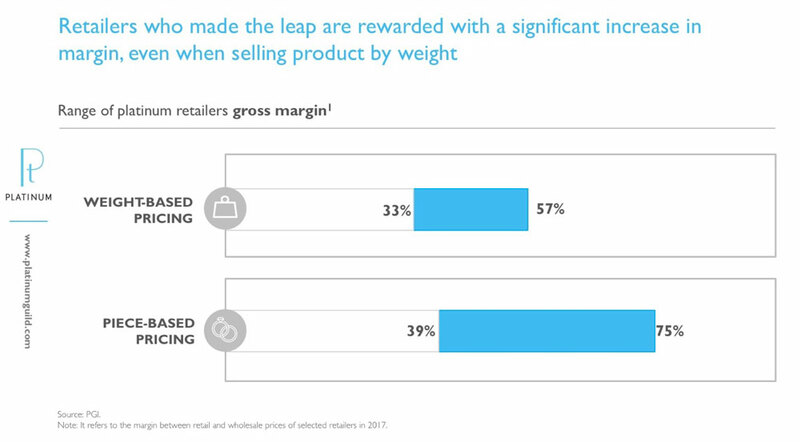 However, without additional value creation, consumers may not be willing to pay a higher premium for a generic product. Due to fierce competition, where one can find multiple jewellery stores within a small radius, consumers are likely to compare prices at other stores. This leads to product differentiation, with more emphasis on product design, branding, and marketing by individual retailers. But what would be the most effective way to do this? To find the answer, some retailers have posed more questions: Which type of consumers are the target customers? How does the retailer convey a design and an appealing story that matches a particular brand? How do they keep up with changing consumer preferences? This new transition challenges the traditional way of producing and selling platinum jewellery. Fundamentally, it departs from the product-focused marketing strategy: developing a product efficiently, then trying to find a marketing angle to sell it. Instead, it needs to be driven by – and start with – understanding consumers’ attitudes and desires. In such a transition, marketing based on consumer insight plays a more vital role not only in the success of the platinum jewellery retail businesses, but also in growing incremental demand as a whole. It helps to identify and quantify the business potential for a new segment, instead of competing within the existing market segment and demographic. Operationally, retailers need to reposition platinum in their product portfolio and re-evaluate their business model, from the supply chain to product distribution to sales. Manufacturers are also required to provide sustainable new designs, branded collections, and other services to accompany product offerings. Investing in technical R&D is vital to enable complex designs. of a new market segment. 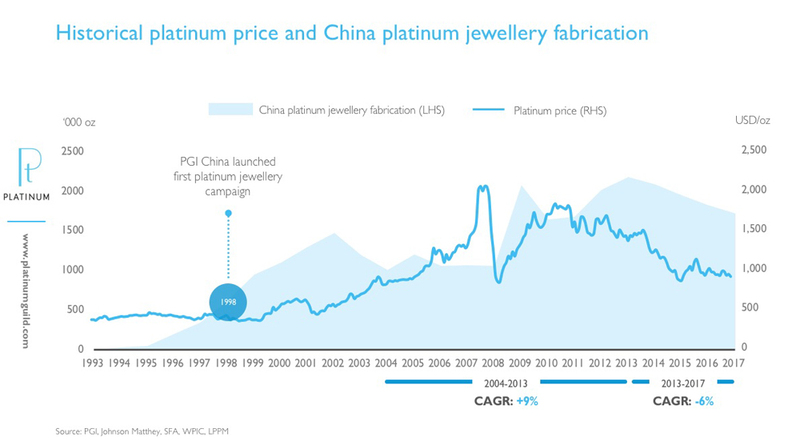 It is fair to say that the Chinese platinum jewellery industry has undergone some profound changes, transferring from a majority of generic offerings based on production costs, to more value-added product differentiation based on consumer marketing. This has been challenging for traditional retailers who sell homogeneous products in large volume. Therefore, it will take some time and will require professional support on consumer segmentation, branding, design innovation, product display, marketing, and supply chain management to restore growth momentum. It is also fundamental to enhance the competitiveness of platinum in the jewellery industry and balance product offering in the platinum jewellery market. This will allow retailers to capture the great potential of new market segments and new demographics for platinum jewellery.